Planning for a baby is a special and exciting time, but it can also be stressful. One of the areas in which my husband Britt and I felt this stress was with financial planning. We are both teachers, which means a tight budget, and we knew that adding a baby to our family would bring additional expenses. We also made the decision that I would take six weeks of maternity leave at the beginning of next school year (baby girl is due this summer), and it will unfortunately be unpaid. Now we really had some budgeting concerns! We knew it was time to start saving like crazy. With the recommendation of several friends, we looked into Dave Ramsey’s money management system. I went onto his website and reviewed the free articles and information there, and then Britt and I sat down to create a budget system that worked for us. Dave Ramsey recommends that you start by paying off your smallest debt first. By putting all of your extra assets toward your smallest debt, you are setting an attainable goal that will be realized more quickly. The immense feeling of satisfaction and accomplishment will motivate you to attack the next largest bill. This seems so logical, but it was the exact opposite of what we were doing. Our debt consists of my student loans and each of our car payments. We were paying a little extra on all three of these bills each month, trying to knock them all down at once and not making any noticeable progress. By instead focusing all of the extra money each month onto my student loans, I am excited to say that they will be paid off within the year. We implemented Dave Ramsey’s monthly budgeting system, which is based on using cash only. For each category in your budget, you withdraw a set amount of cash for the month, and that is all you are allowed to spend. For example, if it is the end of the month, and you only have $30 left in your grocery fund, then your challenge is to raid your pantry and see what you can do with what you have on hand plus $30. 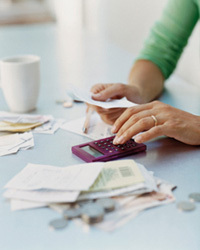 It seems harsh, but by following this method, you will be amazed at how your spending and saving patterns can change. This was something very new for us, as we never carried cash and were very used to swiping the debit card. The unfortunate result was never really being accountable for how we were spending our money, as long as we knew we had plenty left for the month. We were surprised at how much we were spending and on what we were spending it. We logged onto our online banking and brought up the previous month’s statement. After looking at these figures, we decided how much we thought we should be spending in each area. We created five categories for our monthly budget after bills (yours may be different): groceries, eating out, Sarah spending, Britt spending, and household maintenance. We decided on an amount for each category that does not change much from month to month. We did not budget in for bills since they can fluctuate each month (ex. power bill changes, water bill does not come every month, etc.). We put our gas on a cash rewards credit card and pay that off at the end of the month, so we count it as a fluctuating monthly bill. After pay day (once a month at the end of the month), we pay all of our bills. We look at what we have left in checking and subtract out the total for the bills we have just paid. From the remaining amount, we subtract out the money for our monthly budget categories (mentioned above). We go to the bank and get this money out in cash. 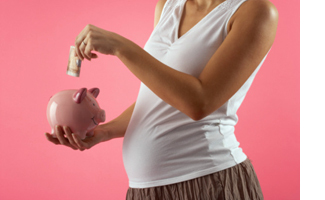 From the remaining money in checking, we subtract out additional savings for our baby nest egg. Anything that is left in checking is our safety net for the month. Dave Ramsey teaches that every dollar has a purpose, and that you should never just have extra money sitting in your checking account. We leave ours in the bank until the end of the month as our safety net, but we do not use it unless there is an emergency or unexpected (and unavoidable) expense. At the end of the month, whatever remains in checking that we have not had to use (which is hopefully everything since no swiping is allowed unless there is an emergency!) is also transferred into savings as a second payment into our baby nest egg. Each month when you sit down to pay bills and figure out your budget, you may have to make changes based on what is coming in the month ahead (ex. a car is due for an oil change, a birthday or anniversary, etc.) Money for these expenses should be taken out in cash also. You should decide how you will handle the cash that is left over in one or more categories at the end of the month. If we were really strict, we would deposit that cash into savings, but we often end up using it to go out to dinner or get a little treat. We work so hard to live by such a strict budget that the extra treat is nice. We have been using this system for a few months now, and it has made a huge difference in our spending and saving. It does take time to figure out how to make the system work for your family, and each month we have made adjustments to our plan. Although it is hard when we want go out to dinner or do some shopping and the money is not there, it feels so good to be accountable for our spending and to know we are doing what is financially right for our family. Every family’s budget will look different, and it will take time to figure out what works for you. Be patient and stick to it and you will see great results. Happy budgeting! 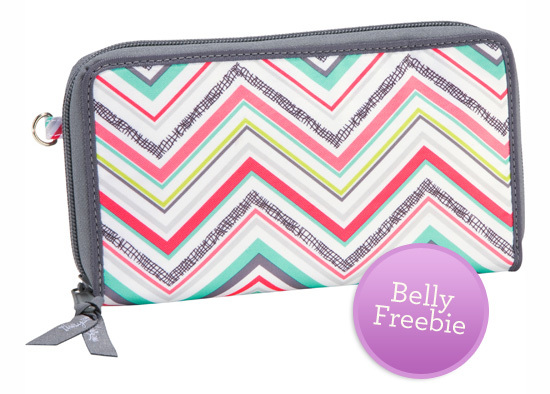 This coupon clutch from Thirty-One Gifts has five interior pockets, each with its own tab and label — perfect for keeping track of your categories and keeping cash organized. Bonus question: Tell us your favorite money saving tip. Deadline: Wednesday April 3 at 11PM EST. Time to save! My best budget tip is making a menu for the week that incorporates when you’ll have left overs and how to re-purpose those leftovers in new ways! Time to save!! I need some budgeting in my life. I have found that planning out a menu before heading to the grocery store helps me not stray and purchase things I don’t need. I also try and throw in as many coupons as I can. Time to save! My favorite budget tip is shopping at “off brand” stores and buying generic whenever I can, and coupons for whatever is not available in generic! Time to save! money saving tip is to always make a list and try to stick to it. Time to save! I always plan my meals for the week based on the grocery store’s sale flyer. It saves $ and helps to inspire recipe ideas. Time to save! My best budgeting tip is to stock up on non-perishables when they are on sale. Sure I might have a year’s worth of toilet paper in the garage, but it was free! Time to save! need to use more coupons so this would come in handy! Time to save! It’s not original, but stack coupons with sales & store deals whenever you can. time to save! could use a clutch. Time to Save! That clutch would make me look at my coupons more!! Time to save! I save by buying off brand for most purchases as well as using coupons, price matching guarantees and loyalty programs. I also shop holiday clearance sales for gifts/etc for the next year. I save money by going as long as possible without spending any money. You would be surprised what you don’t need if you just wait to buy it. Time to save! My best money saving tip would be shopping online! Using ebates and reading deal blogs saves a ton of money. Time to save! My best money saving tip is to use coupons on sale items at as many stores as you can every week, the savings really add up. I also make as many things from scratch as possible, although a sometimes prepared items are cheaper with the sale + coupon buys. Time to save!… I always use coupons with everything I buy! Time to Save! Signing up for free samples is a must. Those samples usually come with high value coupons!